Classic Copenhagen supermum on a classic Danish cargo bike. [although my wife is the superest of supermums...] - The Triobike. Three in one. You can ride as seen above, you can detach the bike and push it like a stroller or you can pop a front wheel on the bike part and use it as a regular bike. Just be sure that you're looking frightfully stylish while you ride. Because we horribly biased towards Danish brands, we're always keen to point out that Denmark is the spiritual home of the cargo bike. Over 70 years ago the Long John was being used to transport goods around the cities. The number of brands and makes has only increased through the years. The Short John, the Christiania Bike, the Sorte Jernhest, the Nihola, the Trio, the Kangaroo and so on. The cargo bike is enjoying a massive revival these days as opt for one to transport their kids around town and to carry the groceries home. Over at our sister blog - The Copenhagen Bike Culture Blog - we have numerous posts about cargo bikes. - You can check out our blog posts with the Cargo Bike label. - Read a consumer test of five cargo bike brands. - Read about the award-winning Nihola cargo bike. - Read about other Danish cargo bikes. THIS IS THE BEST PHOTO ON BIKES I'VE EVER SEEN!!! Is it common in Copenhague?I love this city!! the supermum cargo bike looks great in the bike lane, but if i saw that detached HUMMER stroller coming towards me on a sidewalk it would be a frightening sight! For as much teasing as I dish out, its only rightful that I get some back! Here's a little cargo bike history, demonstrating what I nerd I can be! Its a very good question when the first dedicated load carrying bikes appeared. I've got a photo of a trike where the riders seems to be pedaling 2 wheels in the front directly through a sort of treadle on the axle, while the rear wheel is little and seems to steer. The cargo box is in the middle. Solid tires. Its dated 1901. They I've a few other undated photos that seem to be about as old. Within a few years after that almost all bikes had pneumatic tires. Long John format bikes (long 2 wheelers with the load behind the front wheel) seem to have appeared in the 1920's. Credit is generally given to the Danish though I've never seen a Danish Long John that was clearly pre WW2. I also haven't really tried to find one. I have seen Dutch transport bikes of the same basic format from both Maxwell and Veeno that appeared to be from the 1920's-1930's. Pashley in England also had a version. The Long John is an extremely handy type of bike so its quite likely that wherever they were invented, it was quickly copied elsewhere. Until the Bakfiets Cargobike child carrier and its copies showed up in about 2001 the Danish had made infinitely more Long Johns than anybody else. I suppose that's why they're all known as Long Johns. henry: thanks for that info. i'm quite sure that the dutch have fiddled with cargo bikes ever since the danes have. addendum: my dad rode an old long john when he was a delivery boy at the age of 15 in copenhagen. and that was in 1942... so if the long john was old THEN... it must have been pre WW2. no photos of it, unfortunately. Hmmm... Good question whether the Netherlands or Denmark has more makes of cargo/kid transport bikes (not just bikes with kid seats or a rack on the front but special big ones with boxes and so forth). WorkCycles, Nijland, Apollo, Bakfiets.nl, Fietsfabriek, 't Mannetje, Onderwater, Gazelle, DeRedding, Feetz, Babboe, Box Bike,Tuk-Tuk, Dutch ID and a handful of Chinese-made rip-offs too horrible to mention. Christiania, Esimex, Nihola, Bella Bike & Sorte Jernherst (or are these the same? ), TrioBike & Winther. 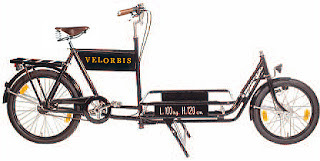 Velorbis sells the now Swedish Monark Long John but we I'll count it since it was once the Danish SCO. That's a score for the Netherlands but then NL is about twice as big as DK. Also every city in the NL is a bicycle mecca. My one trip to Denmark gave me the impression that cycling is huge in Copenhagen but much less so elsewhere in the country. Is that the case? ps: Keep up the good work on your great blogs! i bow to your [nerdy] knowledge, henry. but there are DK models you're missing. nevertheless, our two great cycling nations are... well... great. there are, however, great bike cities outside of copenhagen. Odense, Aarhus, Aalborg to name three of the larger ones. while provincial netherlands enjoys a great number of cyclists, provincial denmark is not that far behind. That about sums it up: Denmark and the Netherlands are the cycling capitals of the western world, both absurdly far ahead of any other nation. The gap between NL/DK and the rest of the world is really illuminated when you look specifically at urban cycling instead of the general national cycling statistics (yes, with the rapidly shrinking exception of a few asian nations). indeed, henry. have a look at this post at bikeportland, written by one of your countrymen. "But wait, doesn’t everyone in The Netherlands already ride? Not exactly. "Hesemans estimates that country-wide, the number of people that ride is less than 30% — and he says, due to several factors, those numbers are trending downward." the Trio has a long way to go to match the sales of the other big brands. we don't see that many on the streets here in Copenhagen as of yet.